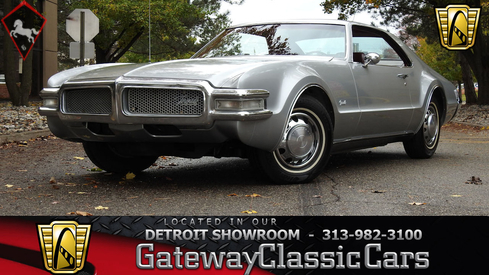 General description : Gateway Classic Cars is proud to present this beautiful 1968 Oldsmobile Toronado for sale. This beautiful piece of machinery is a rare find based on its low production numbers and available options. This Toronado comes equipped with a monstrous 455CID V8 which was only available in Oldsmobile Toronados of this style from 1968-1970. The beefy 455 CID V8 is backed by a smooth shifting and reliable 3-speed automatic THM-425 transmission, providing ease to the driver’s experience. This transmission was added from a W-34 car, giving it quick and firm up-shifts. The car sports a uniform silver with chrome accents that really make this car glisten in the sun. Inside, the car comes equipped with well-maintained red vinyl front and rear bench seats. One thing that makes this car stand out from the rest is the elimination of the floor “hump” which is present in rear wheel drive cars. So, get 5 others with you and let this sweet ride lull you. Another cool and unique feature on this Oldsmobile Toronado is the roller style, almost slot machine like, speedometer which rolls as the speed of the vehicle changes. 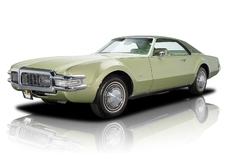 Other options on this beautiful 1968 Oldsmobile Toronado for sale include: A/C, power brakes, 6-way power seats, power steering, telescopic wheel, AM/FM radio, power locks, vinyl interior, radial white wall tires, and power windows. For more information on this 1968 Oldsmobile Toronado, visit http://www.GatewayClassicCars.com or give our friendly and knowledgeable showroom staff a call at (313)-982-3100. 1968 Oldsmobile Toronado 455 CID 4BBL V8 is listed for sale on ClassicDigest in Dearborn by Gateway Classic Cars - Detroit for $19995.